Our entire ministry is based on the spiritual care of our patients and their families. We are here to share God's love and comfort - reminding everyone of the firm foundation of God's love and provision for us through Jesus Christ. When Hope House parents feel stressed, or a Hospice family is struggling with grief, our Spiritual Care Team is available to listen, pray, and provide comfort and practical suggestions. We offer these services at no cost - not only to our patients and their families, but to the entire community. Southwest Christian Care hosts a memorial service once a year to provide an opportunity for sharing between team members and the Hospice and Hope families we serve. The service takes place the first Thursday following Thanksgiving for families of loved ones who have passed away from November 1st to October 31st each year. Nurses and the social worker from the care team continue to stay in touch with family members for one year. Families receive emotional support through personal contacts plus written materials about grief and coping with loss. Family members may receive calls or visits from a Bereavement Volunteer for up to a year following the death. Encouraging correspondence is sent to families during the first year following their loss. This contains information to help individuals cope with loss-related grief and mourning. We offer short-term spiritual counseling at no cost to help families and individuals deal with issues related to grief, loss, trauma, family stress, and other life-related issues. Counseling is available on an appointment basis. 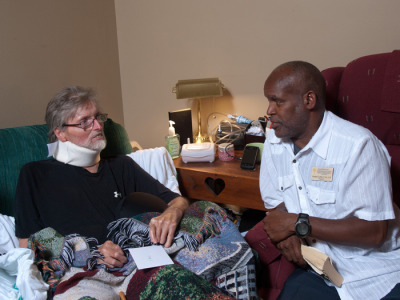 Our experienced Chaplains visit patients on a regular basis and are also available when special needs arise. We respect the beliefs of each individual patient and family member, regardless of their faith. These groups offer individuals the opportunity to experience supportive and affirming fellowship with others who are "walking a similar path" of grief and loss. There is no cost associated with our Grief Support Groups and they are available to the entire community. Contact Carol Vancil at 770-969-8354.